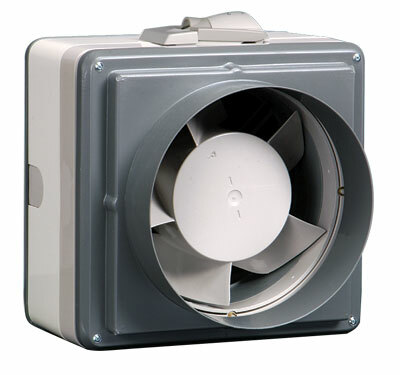 No other range of high performance in-line duct fans offers a combination of 3 impeller diameters, reversibility, low sound level, speed control and built-in electric shutter. T-Series features a unique speed control pack which enables high, medium or low speed to be preset to suit room size or required duty. Designed for use with rigid or flexible ducting, T-Series In-Line models can be plate mounted or fixed through partitions and in ceiling voids. T-Series controllers may be used with this model to obtain a choice of speeds, extract/intake airflow direction and automatic sensor operation. The Vent-Axia Ecotronic controller gives even greater running economy with its minimum speed setting and ‘E’ mode. The shutter is electronically controlled by an actuator with a damped action giving quiet operation during instant opening and closing. The interlocking edges of the shutter blades provide maximum back draught protection. When the fan is used with a T-Series or Ecotronic controller, the shutter can be set open with the fan motor switched off to provide natural ventilation without the security risk of an open window. Where ducts pass through an unheated roof void, the duct should be insulated. Horizontal ducts should fall away from the fan unit. In circumstances where an excessive amount of moisture is present, a condensation trap should be installed in the exhaust duct. The fan unit should be accessible for regular maintenance. Suitable for operation in ambient temperatures from -40°C to +50°C. Fitted with Standard Thermal Overload Protection (S.T.O.P. ).